Yes, it's true - I do have a bit of a thing for chocolate...both the edible kind and anything chocolate coloured. So I've been doing a weeny bit of knitting with chocolatey coloured yarn too. 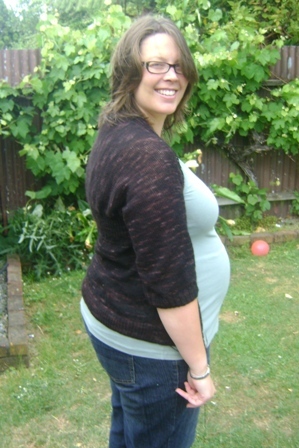 This was my first knit for our babe due in Feb. 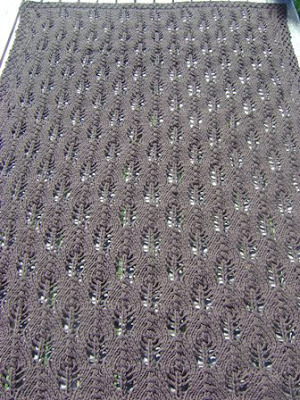 I loved the look of the pattern, and the idea of double stranded knitting appealed too as it says to me 'I knit up quickly'. 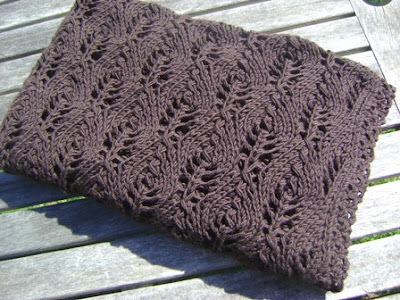 I was originally going to knit it in WOOLganics Deep Earth but in the end I found 10 balls of gorgeous chocolate brown Bendigo Woollen Mills Melody (a cashmere, merino and microfibe blend) in my stash and so that's what I decided to go with. It's lovely and squishy too - I can't wait to snuggle a new baby up in it. The pattern is Jared Flood's 'Wool Leaves' and you can purchase it through Ravelry for what I thought was a very fair price, I think it was $3.50USD. I did make a few minor modifications - the pattern is written to double strand 10ply, but my melody was 8ply (which I actually like, it's not too heavy in 8ply - especially once blocked) so I downsized my needles to the equivalent of a 7mm and cast on 91sts so there were 2 more repeats across. This worked out perfectly in my opinion. 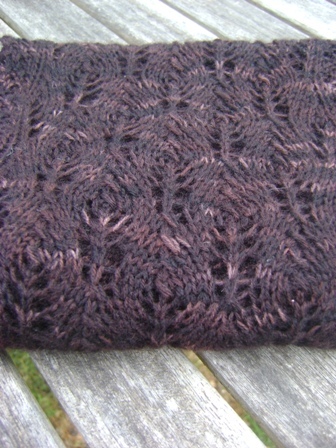 And then finally, I had almost a skein of my chocolate lace left - and I really liked that Wool Leaves pattern, so decided to double strand my lace and downsize my needles to knit my midwife a scarf. After looking at a few other lacy scarf patterns on Ravelry, I used the equivalent needles to a 3.75mm and cast on 41 sts and then just knit the pattern till I had had enough. The result - a lovely soft silky lacey leafy scarf. Watch this space too - this isn't the last you'll see of the Wool Leaves pattern...I may have cast on something knit using it over the Christmas Holidays ;) But that'll need a post all of it's own. Gorgeous, gorgeous, gorgeous! 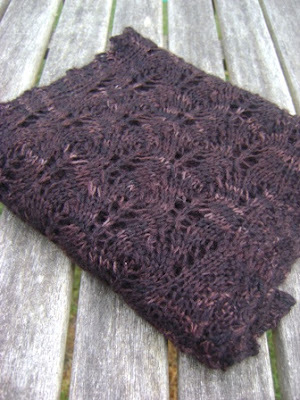 I love chocolate brown too but havent knit anything for a while out of that color! I cannot wait to see what you created over xmas.